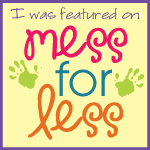 I have been able to use many of the materials I made for college courses with Skyler. 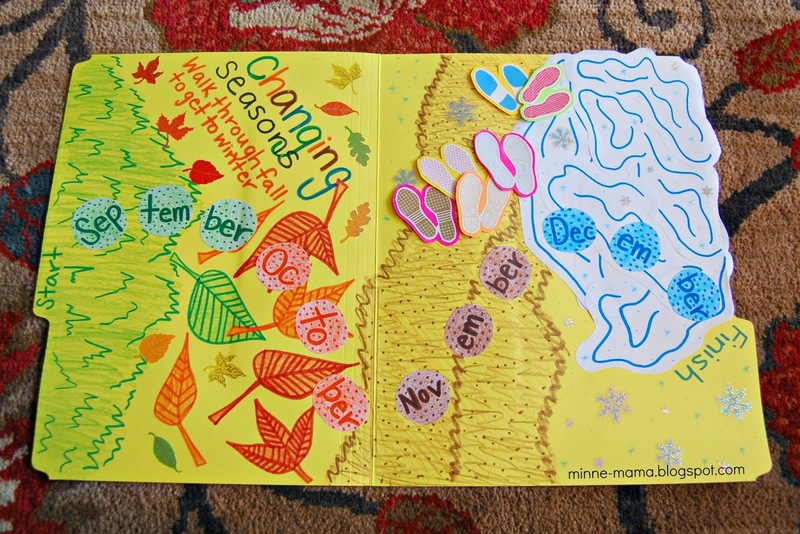 I used the dyed pasta and colored egg cartons from my kindergarten student teaching in a sensory bin, and we have enjoyed using the peek-a-boo booklets I made for another course. I created this material for a college class, and cannot use them with Skyler yet, but wanted to share this fun activity. 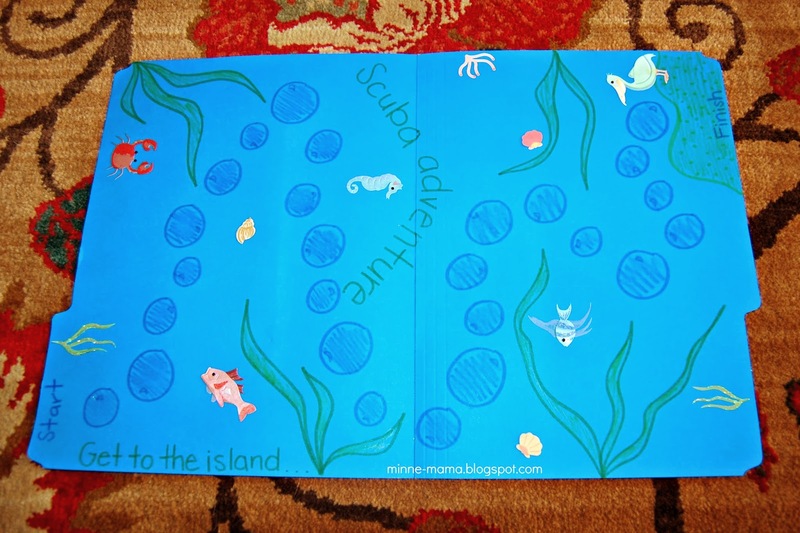 I took a tutoring course for language arts, and these file folder games were a way to practice word study. I would write a sentence with a challenge word on a card and we would move forward in the game if the word was said correctly. 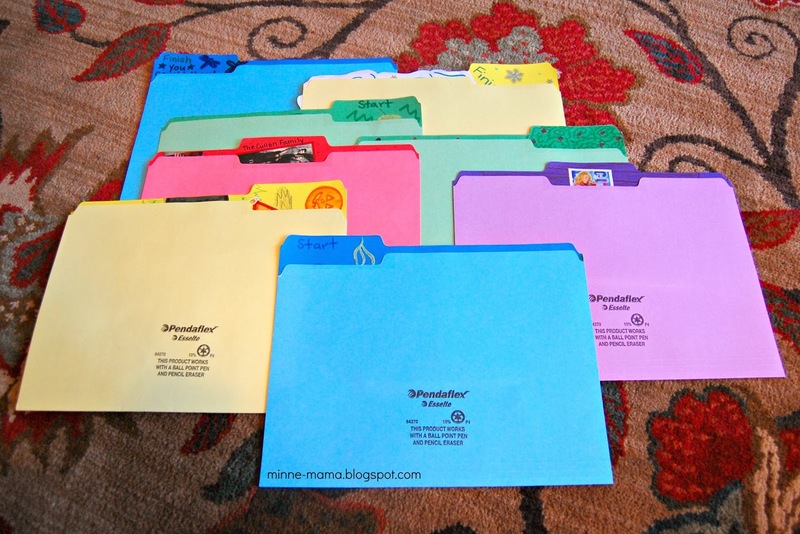 These file games could be used with other topics as well. You could do it with number or letter recognition, math problems, or any other area that needs practice! Three of the games were made specifically for the second grader I was with. She told me when we met that she liked Tinkerbell, Hannah Montana, and Twilight, so I made games based on those interests. 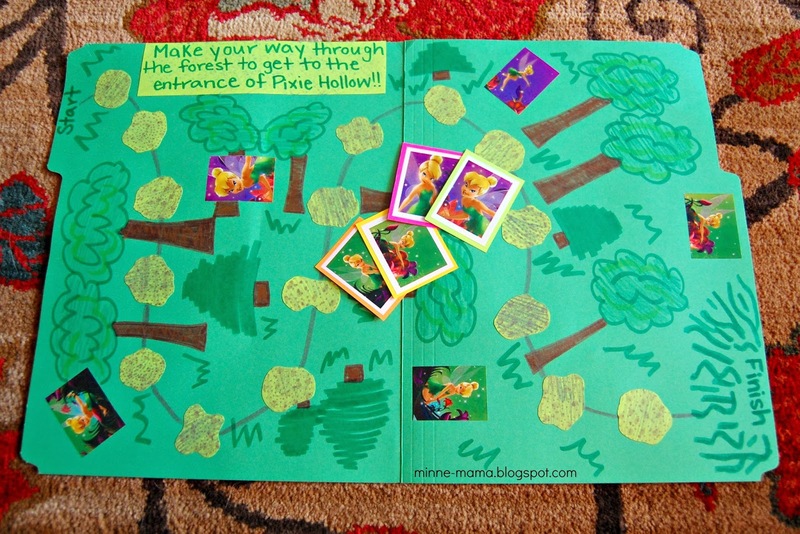 The Tinkerbell game was decorated with colored pencil, construction paper, and Tinkerbell stickers as decoration and the playing pieces. This game was simple, just moving forward one space with every correct word. 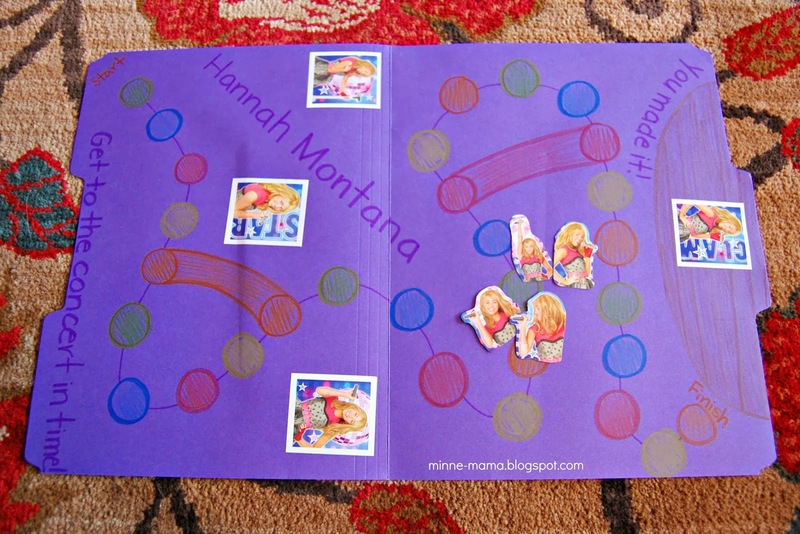 The Hannah Montana game was simple with stickers and colored pencil. I added the bridges to make this game a little bit different. 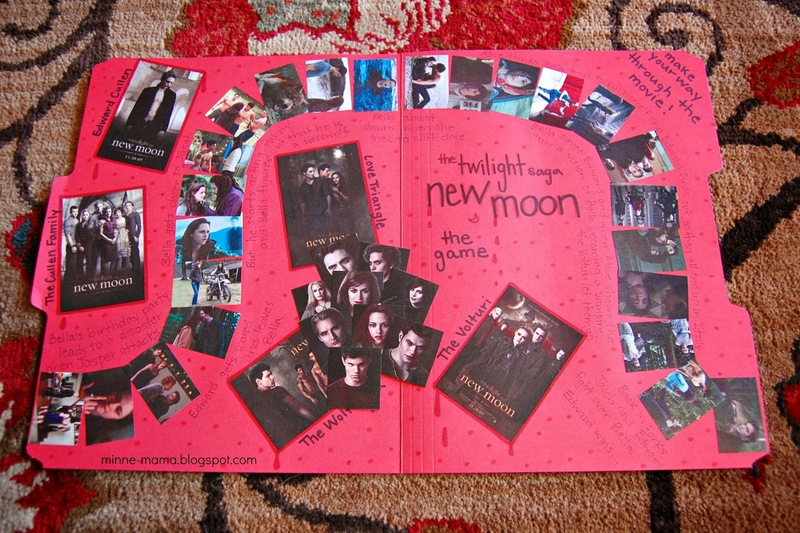 My tutee helped me create the Twilight game by telling me ALL about the movie. I found a website with all of the pictures from the movie and cut them out in the order. She did tell me that some of the pictures were in the wrong order or that it was from the wrong movie - whoops! She also helped make this game by telling me what to write as the synopsis along the pictures. The moving pieces were simple with this game, all of the characters from the movie could be chosen from. The other games I made were inspired by either the color of the folder I was using, stickers I could find, and a couple were made for the time of year. I found these cute frog stickers to use as the playing pieces and decorations for this lily pad game. 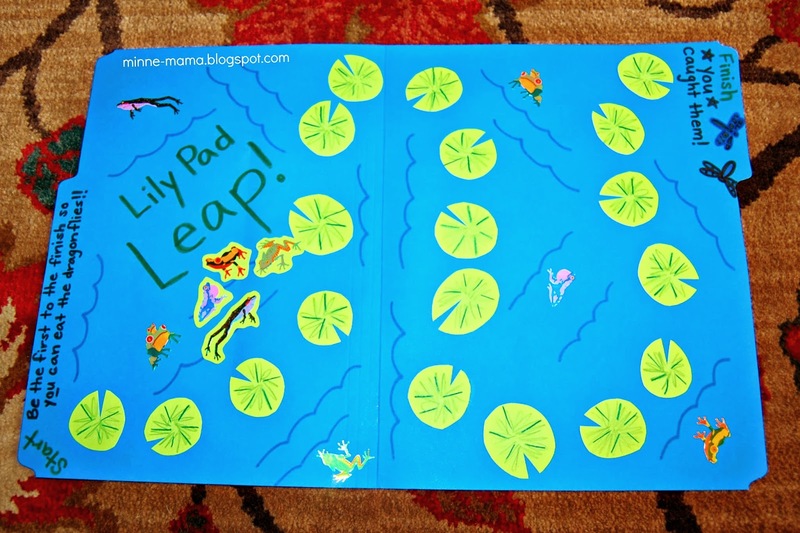 I cut the lily pads out of construction paper and the rest was done with colored pencil. I don't know why I thought it was a good idea to have winning the game ending up in winter, but this game was inspired by the leaf and snowflake stickers I found. The playing pieces for this one were a little harder to come up with. 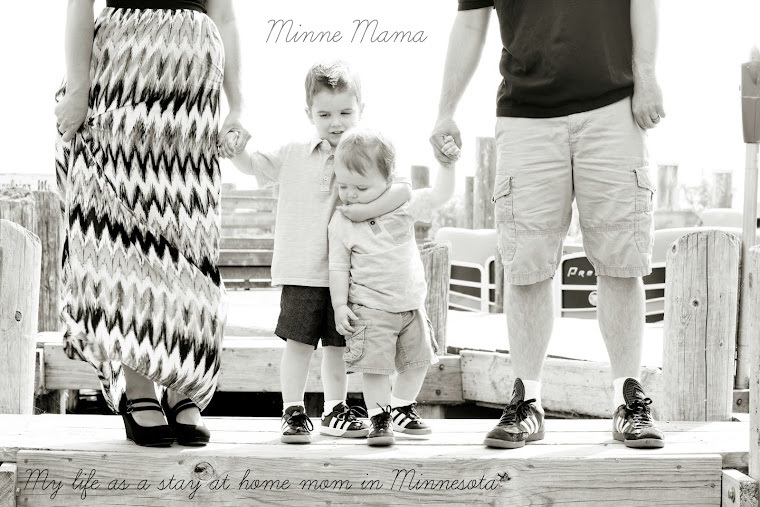 I found the cute foot prints and printed them out, backing the thin paper with card stock. Again, inspired by the underwater themed stickers, you move along the bubbles with moving scuba masks (not sure where those went!) to get to the island with the cute pelican. 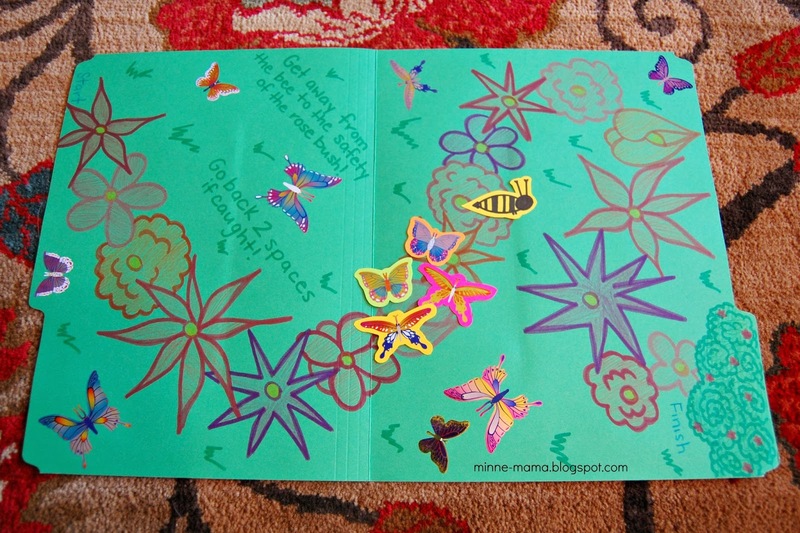 This game, made for the butterfly stickers, was completed with flowers drawn with marker and colored in with colored pencil, and the addition of the bee was something new. We moved the bee around every turn and if caught, you had to move back two spaces. The most time consuming game was also the most fun. I was tutoring in the fall and made a trick-or-treat for Halloween. It didn't take too long to make once I decided how I wanted the game to work. I found the cute costumed animal stickers and then found some images of candy online and printed a ton. 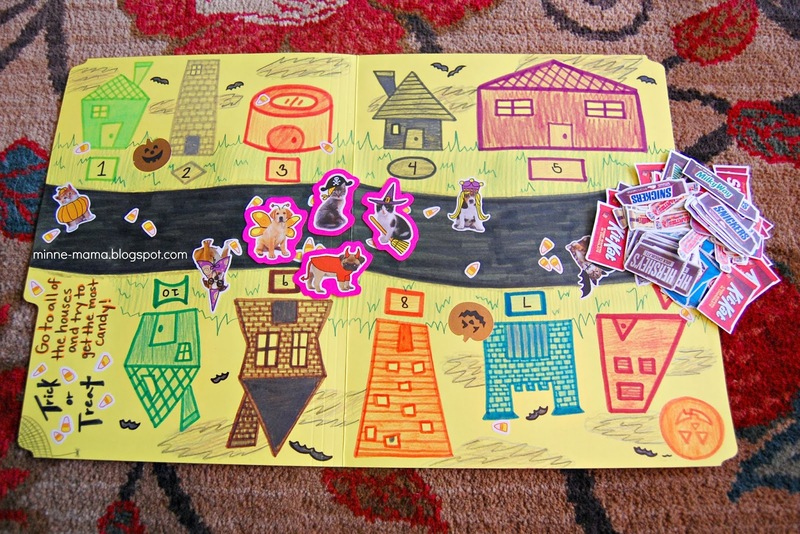 This game was different, you went to each house in order and if the word was said correctly, you got a certain amount of candy. Whoever has the most in the end wins. We had a lesson plan we had to follow for the tutoring program, and only had ten minutes for the word study section, so I don't think we ever actually finished a game, but it didn't matter. 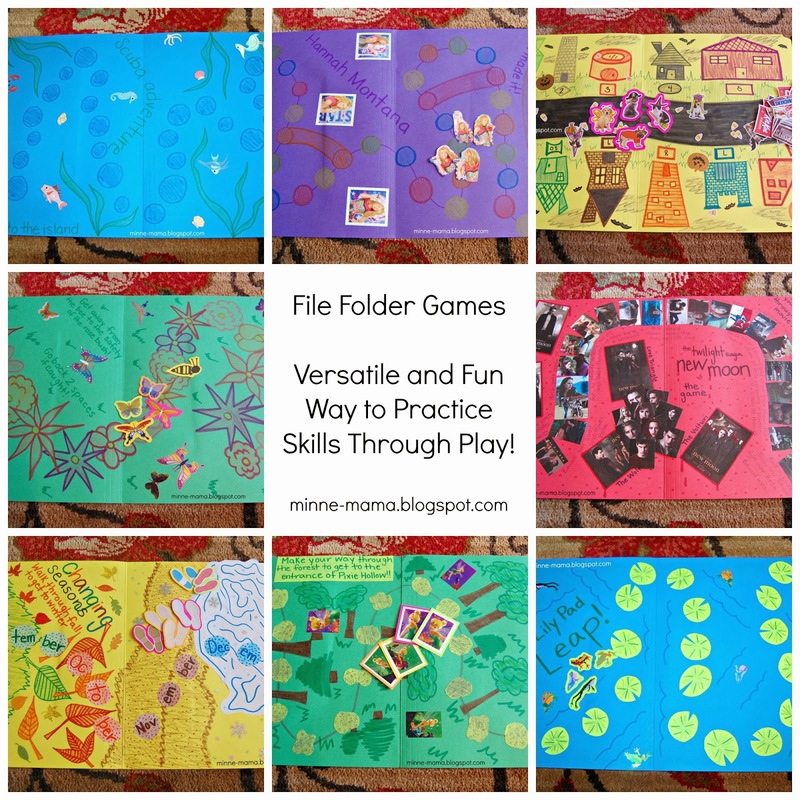 The file folder games were a fun way to practice some challenge words and they were simple to create. I started off with (I think) three of the games, and would make a new one when we were bored with the ones we had. These games would be great to have as a busy bag. They are easy to travel with (I have all of the game pieces attached to the outside of the folder in a plastic snack bag) and they can be used to practice whatever topic is needed. These games would be great to have as a busy bag. 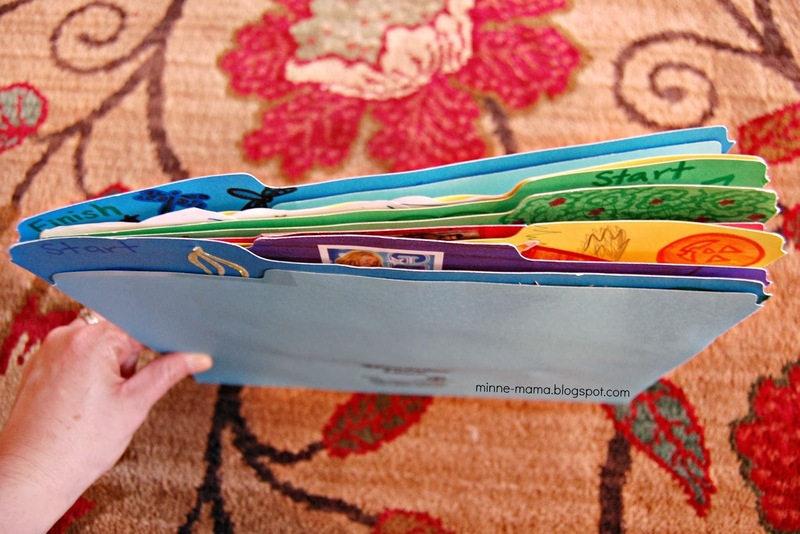 They are easy to travel with because they are so thin (also, I have all of the game pieces attached to the outside of the folder in a plastic snack bag) and they can be used to practice a variety of topics. These are wonderful because they can be made based on the interest of any child (treasure maps and pirates, vehicles, safari, 50 million versions of Dora the Explorer) and they can also be used for whatever skill needs attention.